We’re willing to bet that, as a homeowner, you’re not spending a ton of time thinking about the hinges on your screen doors. When you own a home, there are plenty of big projects on your plate. However, after you’ve done a few of them, or hired a contractor or two to get the work done for you, you realize one essential truth: The tiny details matter. And one of the most important details on the screen doors of your home is the hinges. The correct screen door hinges make for a sturdy screen door. After all, those hinges are going to see a lot of wear and tear in the decades ahead. Choosing a strong screen door with the best features is important precisely because you don’t want to spend a ton of time thinking about them. You want to buy your screen door, and never worry about it again. The last thing you need is a broken screen door hinge. Which means you should understand the difference piano hinges can make. Piano hinges, sometimes called continuous hinges, are built to deliver years of trouble free use and keep a screen door from sagging. Screen door piano hinges offerthe longest lasting high performance. Piano hinges are designed to evenly distribute weight and minimize stress on whatever they’re attached to; if they can handle a heavy piano lid, they can certainly handle a screen door. You’re going to be using your screen door a lot, and piano hinges will help to ensure that it opens and closes perfectly for years to come. Piano hinges are easy to install. This not only saves time and effort, it means it’s far more likely for your door to be installed properly. Piano hinges help to create lasting door alignment. A piano hinge enables perfect alignment and makes sure that the weight of the door is evenly And because it is so sturdy, it will hold the door solidly in the doorframe for years and years. Who wants a squeaky door! Screen door piano hinges produce significantly less noise than conventional hinges for smooth, quiet operation. Piano hinges provide a cleaner appearance. 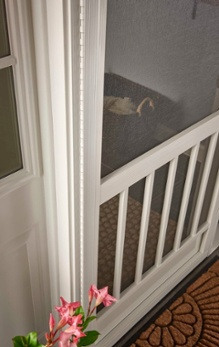 A piano hinge offers a cleaner look to your entry by running the full length of the screen door. A full-length piano hinge is just one of the many features that you’ll find on a PCA Aluminum Screen Door, which comes with a limited lifetime warranty. A screen door built to last, with features you’ll enjoy for many years.